The discovery 25 years ago that RNA can be enzymatic permits us to speculate that pre-biotic self-replicating molecules may have been RNAs. 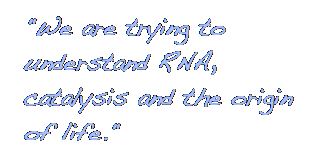 This is known as the "RNA World" hypothesis. 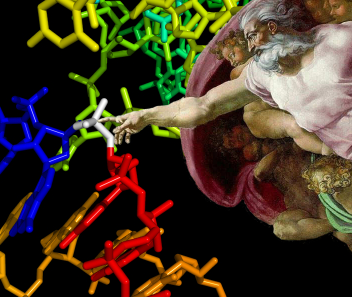 As a first step to understanding what properties of ribozymes are of fundamental importance to a plausible RNA World evolutionary scenerio, and how RNA catalysts evolve in three-dimensional space, we have solved the structure of an RNA Ligase Ribozyme that catalyzes the assembly of RNA from a nucleotide-5'-triphosphate fragment.